Our chooks have attitude. Lots of attitude. Just ask Mango. Mango is our dog. A somewhat loveable (he doesn't actually like me, but that's another story) cairn terrier. He's a fairly independent lad, who isn't entirely wrapped to be sharing his domain with 2 chooks. Especially 2 chooks with attitude. He has, at times thought about having a crack at the chooks. He only has to think about it and well, he ends up being chasee, rather than being the chaser. I kid you not. One dirty glance in the direction of chooks and they turn on him, wing flapping and squawking with glee. I did feel for the little dog the other day when I looked out the window to see Mango piss bolting at top speed across the front yard with not one, but two chooks in hot pursuit! That evening, I defrosted some chicken thighs (stir fry) only to find they were off. Oh well, I thought to myself, Mango will have them. I plopped them in his bowl. Mango looked at me as if to say "you've gotta be kidding!" I don't know what they're putting in chicken these days, but since that evening the tables have turned. 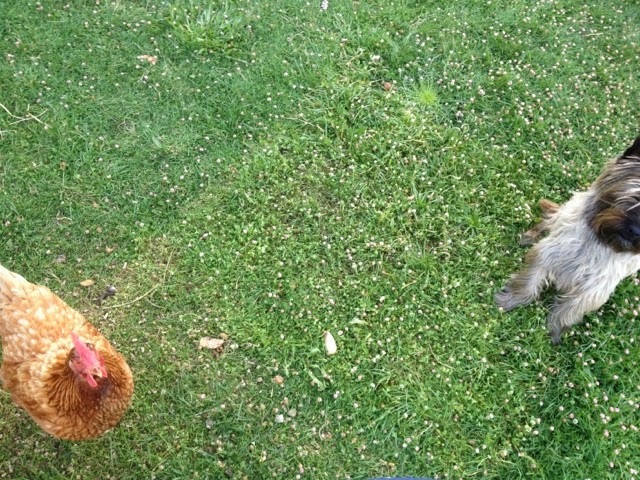 Mango has new found chook confidence. George relayed a story to me the other this morning.